The Chamaecyparis genus consists of 7 species of monoecious, evergreen, coniferous trees from forest in Taiwan, Japan, and North America. They have flat overlapping sprays of scale-like adult leaves 1-5mm long. Their popularity as an ornamental garden tree has given rise to a large number of readily available varieties and cultivars. Chamaecyparis is a popular genus for bonsai however it is difficult to maintain it's appearance and is difficult to style well. 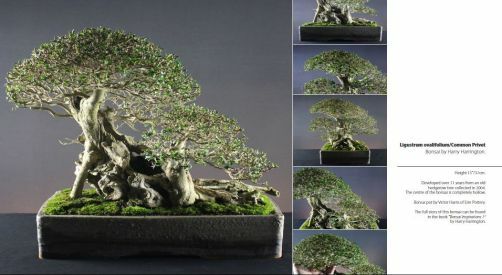 When finding specimens for use as bonsai or when styling, always consider the existing branch placement as backbudding on Chamaecyparis only occurs on green branches and never on mature wood. Broad, conical tree with soft, stringy bark. Flat, fan-shaped foliage is dark-green when mature with bright white bands underneath. Can reach heights of 20metres in its native Japan. There are a number of varieties available of which C. obtusa 'Nana Gracilis' and C. obtusa 'Yatsubusa' (both referred to as Dwarf Hinoki Cypresses) are of particular use due to their naturally more compact growing habits. Nana Gracilis can be prone to loose inner foliage easily which it does not replace. Broad, conical tree with an open crown and finely peeling, red-brown bark. Pairs of sharply pointed, bright-green mature leaves, marked with white underneath, are produced in flattened sprays. Can reach heights of upto 20 metres in its native Japan. There are a number of varieties available of which the most commonly used are Chamaecyparis pisifera 'Boulevard' /Boulevard Cypress which has steel-blue foliage and Chamaecyparis pisifera 'Plumosa' has more frond-like foliage, bright-green when young. Position Full sun, must be protected from strong wind particularly during the Winter. Watering Mist foliage regularly ; will not tolerate the soil drying out, unlike many coniferous species, Chamaecyparis are thirsty trees. Feeding Fortnightly from Spring to Autumn. Repotting Every two to three years in standard soil mix in Spring as growth starts. Pruning Chamaecyparis do not backbud on anything other than green wood. Pinch out foliage continually through growing season to keep compact. Allowing over extension of growth can lead to the irreplaceable loss of inner growth. Do not hard-prune in summer. Foliage that is shaded will often dieback during the Winter. Propagation Sow seed outside in Spring, take semi-ripe cuttings in late summer. Air-layering in late Spring. Pests and Diseases Aphids and red-spider mite, scale insects. Styles All forms except broom in all sizes.